Arti Roller Flour Industries Ltd. is a customer-oriented business house from where you can obtain wide assortments of Wheat Bran Fiber. We strictly accentuate on the top quality raw material in the entire manufacturing process which is sourced from noted suppliers across the world. Our dietary wheat bran fiber is universally praised for its superior quality. 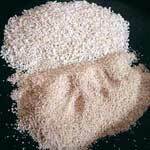 We are one of the well-known wheat bran fiber manufacturers, incepted in India. We offer dietary wheat bran fiber at the most affordable price. Wheat Bran is the best food for cattles and helps in increasing the milk production and keeps them healthy. It is rich source of protein etc.